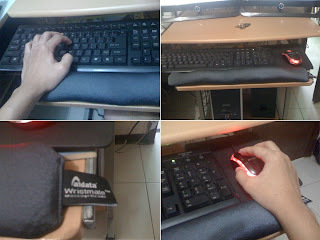 Anyways, I just got into that thought because I realized that I stay in front of the computer, either the desktop PC or the laptop for an average of around 15 to 16 hours a day. Quite a lot, and majority of that time is spent on work. In fact, I recently bought this one. They call it the 'wristmate.' I think the name describes the product well and all of you who use the desktop computer would know how much it would really be helpful especially if you stay on the computer for super long hours like me. I've been actually using that one for over a week now. Pretty good so far. It's got this sandy feeling that takes stress away. I even play with it sometimes. It's like a mini hotdog pillow if you come to think of it (LOL)... except for the different texture. So yeah. That actually proves how I spend a lot of time sitting, eating, singing, etc, in front of the computer. haha. Now, going back to the real question. If you are asking for my thoughts on it then I think I partly am workaholic and partly not. There are just some times I really need to work but I really don't give up my social life for that. That's why I go out that often even for no reason at all.. haha. - yeah, and that involves going out alone sometimes just chilling out. And yeah, I actually enjoy my work that's why most of the time I feel like I am not working at all. haha. Yeah. You get what I mean right? How bout what you think? Am I really that workaholic? d man sad nako ni tusok2.on do oi! hahahha.